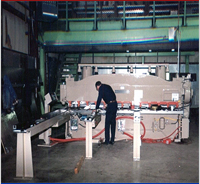 KCF utilizes the most advanced equipment for metal shearing and rolling, forming and bending, punch press operations, welding, grinding and polishing. With our automated equipment, we are capable of holding tolerances within + or - .005 of an inch. 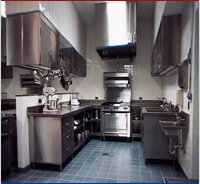 Furthermore, we work with numerous metals such as stainless steel, galvanized steel, carbon steel, and aluminum. 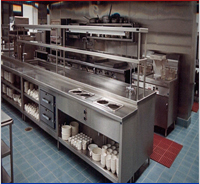 In our 30,000 square foot facility, we manufacture a variety of worktables, sinks, dishtables, hoods, counters, and refrigeration. All equipment can be complimented with a wide array of accessories including display cases, sneeze guards, and lighting. In addition, we can enhance our equipment with architectural finishes such as wood, laminate, solid surface, brass, and glass. 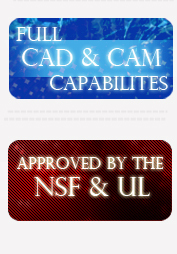 KCF’s automated production facility features full CAD and CAM capabilities and can custom-build or mass-produce metal products to your exact specifications. We can provide budget estimates, competitive bid pricing, and detailed shop drawings. KCF is approved by the National Sanitation Foundation (NSF) and the Underwriter’s Laboratories (UL). 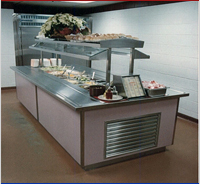 KCF has manufactured products for a wide variety of industries including schools, restaurants, corporate cafeterias, hospitals, prisons, and athletic facilities. In addition, we have provided component parts for other manufacturers and contractors. We work closely with dealers, consultants, architects, and contractors to provide efficient and quality service. We are actively involved in all projects from bid to completion to ensure complete satisfaction by the end user.